Genuine products cost money. If you want excellent quality, you need to pay for it. Knockoff leather bags (like any knockoff goods) may look authentic on the outside compared to the real deal, but you’d be shocked by how many corners were cut to get them on Canal Street. As consumers, we care about the finished product — how it looks and how much it costs. A byproduct of mass consumerism is that people stopped caring about how well something is made. That’s a shame because understanding how much thought and design goes into creating a product with a high bar of quality is essential to understanding why it costs so much. 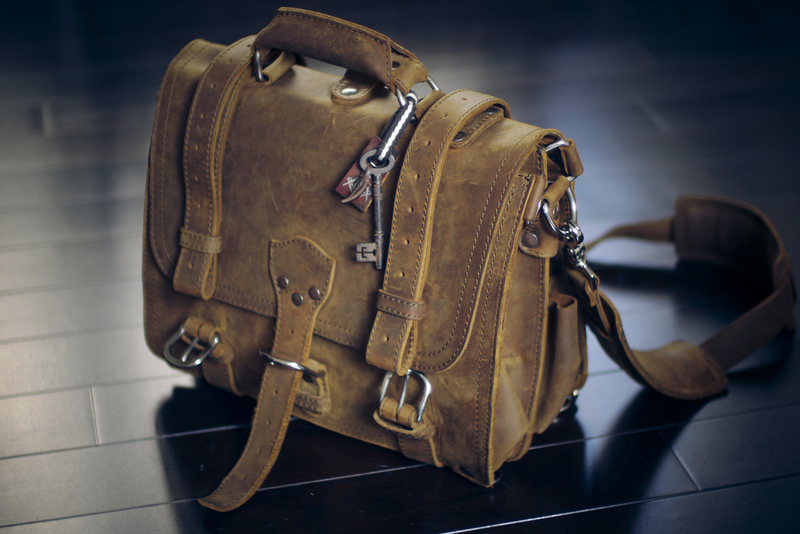 Dave Munson, CEO of Saddleback Leather, was tired of seeing knockoffs of his company’s famous leather briefcases. Instead of fighting the pirates, Munson created a 12-minute video posted to YouTube called “How to Knock Off a Bag.” Created as a humorous “instructional video” for pirates to build better knockoffs (it’s a joke guys), Munson’s video highlights why you should never cheap out and buy a knockoff leather bag, no matter how authentic it looks on the outside. Reason #1: Leather quality. There are different grades of leather. In short, knockoff bags use the cheapest layers of cow hide; so-called “garbage”. You’ll know the leather is poor quality if its coloring comes off easily. Reason #2: Threading. A good bag is held together with a strong stitch, right? That’s only partly true. While a strong stitch is important to keeping a leather bag together, the type of thread used to create the stitching is equally as important. Knockoffs use inexpensive cotton thread. Well-made leather bags use polyester thread (the same kind used on ship sails, parachutes and work boots), which is both super strong and expensive; about twice the price of nylon or cotton thread. Reason #3: Polyester reinforcement. Leather naturally stretches. In order to keep certain parts of a bag strong, polyester inserts are glued inside. Knockoffs don’t come with the extra reinforcement. This is why shoulder straps will fall apart within a few weeks on bootleg bags. Reason #4: Metal hardware. Like buying gold and silver, genuine leather bags such as Saddleback’s use top-notch metal buckles and fasteners. We’re talking about real, solid, stainless steal pieces to hold a bag together. Fake bags use nickel-plated plastic, junk pot metal; these buckles rust and break down easily. Reason # 5: Structural design. Every product is made with a certain number of pieces. For instance, the Saddleback Leather Briefcase uses about 52 pieces; each piece expertly cut and considered in order to provide durability. A knockoff leather bag is the sum of the cheapest pieces its creators could cobble together. So, instead of one solid leather strap cut from a single long piece of leather that can double as a belt, a knockoff would stitch several pieces together to create the same thing. The end result: splits and cracks that ultimately lead to a knockoff bag’s quick demise. We get that not everyone can afford the real artifact. We’re not rich ourselves. That said, we do strongly believe in purchasing authentic products — watches, bags, wallets, gadgets, etc. We all work hard to earn our dollar. And after living expenses and taxes, there is only so much you have left to buy something nice for yourself. Then, why would you spend your hard-earned cash on a knockoff? If you’ve got 12 minutes to spare, we highly recommend you check out Munson’s video below. You’ll never want to buy a knockoff bag or product again.